He is certain that a military solution is no longer on the agenda. The only chance for Ukraine to restore its sovereignty over the occupied areas of Donbas is through political and diplomatic settlement, President Petro Poroshenko has said. "I cannot but say a few words about today’s march in Kyiv. Russian TV channels were the first to broadcast those images - tires, firecrackers, reports about wounded policemen and civilians. These staged pictures are shared to demonstrate that someone is allegedly trying to destabilize the country. I emphasize it once again – and this is an absolutely clear position - there is no military way to bring back Donbas," his website quoted him as saying at the meeting of the National Security and Defence Council on 20 May. 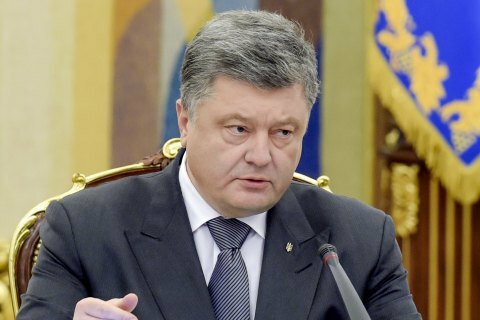 Petro Poroshenko that the main details of the Minsk agreements were based on his peace plan. "It is absolutely irresponsible with regard to the state to disrupt the peace process as this will only lead to the continued occupation of certain parts of Donetsk and Luhansk regions," he said. "As president and supreme commander-in-chief, I cannot allow that. It is not my scenario." He added that the majority of Ukrainians stood for peace and peaceful return of Ukrainian sovereignty to the occupied territories. "We will not leave this road," the president said. The fighters of the Azov regiment, initially a volunteer unit currently incorporated into the National Guard of Ukraine, held a rally outside the parliament building to protest against the plans to hold elections on the occupied areas of Donbas. The rally was peaceful although firecrackers and flames were thrown occasionally.